Hawaii is very plentiful with real coconuts that has come from the local lands here. We have coconuts easily available but that is not most people, and we make a variety of organic coconut products at Earth Shift Products. You can make so many recipes with coconut products such as oils, butters, fermented coconut water, coconut yogurt, milk, cream etc. I would recommend you using 2 tbsp of coconut oil at least once a day in your smoothies, salad dressings, desserts, soups, stir fry’s, sauces or add to any meal you can add coconut oil too. I feel that organic high quality coconut oil is the best overall oil by far when compared to all the other oils on the conventional market. 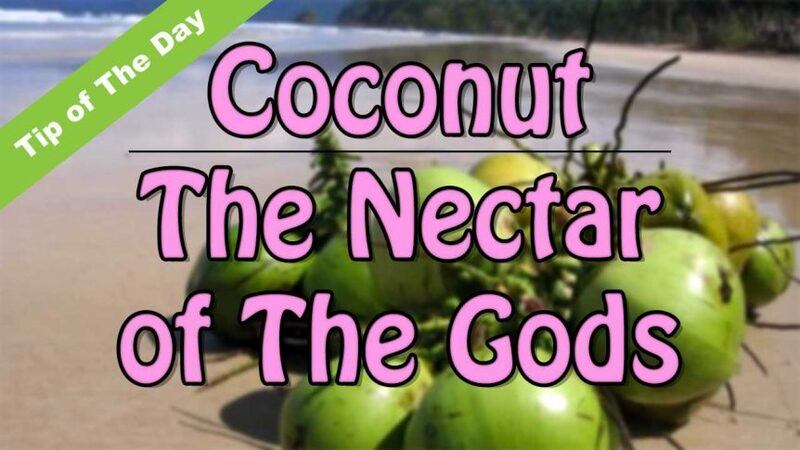 Coconut oil can be used in so many healthy ways especially for the skin, and when taken internally daily it is truly magical on the upper and lower intestines and constant all day energy levels. Substituting this organic coconut oil in exchange for the other toxic, and mostly rancid conventional oils in your kitchen, is a must for sure. Most oils are always usually GMO’s or other toxic rancid oils that you are probably using right now in your kitchen and / or on your skin. This is a simple and very important upgrade in your Earther Kitchen. So is the Toxic Salt you probably have in your kitchen, and let’s fix that as well with these easy upgrades to your Earth Shift Kitchen. Make sure to watch – How To Make Super Mineralized Sole Liquid Salt – where we are going to make 3 Special Sole Salt recipes, and Coconut Oil are magical for health and upgrading the kitchen. These are all of my personal non toxic recipes that I been researching and experimenting with for over 40 years. Every morning I use 2 large heaping tbsp of our ESP Organic Coconut Oil. This is the oil fuel that lasts all day for Breakfast Teas. I used to use raw cow dairy or raw goats milk in my Breakfast Tea daily. When trying to find in the local store real raw, grass fed, organic goat or cows milk is a very hard work order. Remember, these raw milk products are very hard to find organic, but also I don’t want any of my milk that I got from goats or cows to be fed any wheat, corn or soy. This recipe is the better alternative for people using conventional processed and grown toxic cows or goat milk. Please give this secret Breakfast Tea recipe a try – I call this the Dairy Queen Breakfast. Coconuts a truly magical in all of its forms. Most milk, cheese, eggs, fish, birds and all animal feeds are loaded with GMO’s – foods fed to the animals, fish etc and or loaded with a variety of pesticides, insecticides, fungicides, hormones, antibiotics, vaccines to name a few of the inherent problems with drinking / eating good dairy of any kind. I just switched to coconuts and they are much better in every way, and don’t forget the animals should be grazing on live grass too. So, I have replaced the cow and goat daily to a better and much cleaner form of organic clean and nutritious essential fats or fuel for my breakfast tea. Coconut oils are very special because of the MCT ( Medium Chained Triglycerides ) and Lauric Acid components of the oil. It really tastes much better, super creamy and helps you tremendously with your health and many other positive benefits such as a natural antibiotic, stimulation of hormones, loosing weight and having much better bowel movements. Also, using coconut oil on your skin magnesium and silica daily to protect and the feed the body through the skin is what we call “Transdermal Skin Feeding”. If you can get your live coconuts then the next best way is to get unprocessed and quality oils. Check out our Organic Section of Coconut Products that we have at Earth Shift Products. International shipping and free shipping promotions always. Earth Shift Products are 30-50% off market retail, non diluted concentrates minerals and silica, organic superfoods and much more. I have heard that coconut oil is not good for one’s health due to the high concentration of saturated fat. Some doctors suggest no oil of any kind. Can you please give me insight or clarity on this subject. It is hard to find the truth. Some say, take this. Others say, no don’t take that. It gets confusing. There is a great deal of mis-information, dis-information and a lot of confusion, making navigating the truth that much more difficult. One thing to remember is that anything isolated out of nature then becomes slightly unnatural. As the case with all these oils goes, the extraction process is the biggest factor to determine if the oil is even something you want to consume. Poor extraction methods such as using solvents, high pressure, or high temperature will remove beneficial nutrients and denature or change the overall chemical structure. Next would be looking at sources; if multiple sources are used to make a single product it is likely to not be as ‘clean’. In general though you should stay away from heating or cooking with oils, rather steam your foods with water and then add the oil on top after cooking for the flavor of the oil you choose. Cooking methods create oxygen free radicals which can damage the body and gut through oxidation.